Those Italians! How can you not love a cheese whose recipe remains unchanged since at least the thirteenth century? 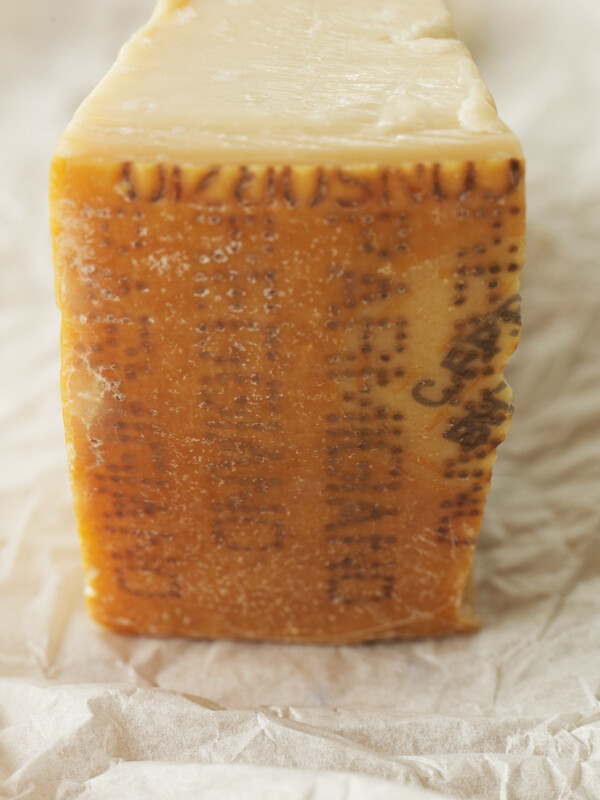 Also known as parmigiano, parmigiano-reggiano, and grana, parmesan’s intoxicating, with spicy fruity overtones, and it bursts into small granules in your mouth. It’s very umami – deeply savoury, enhancing other savoury flavours … and I could go on (it melts without running, browns well, isn’t greasy or rubbery, it’s quickly digested – even by infants – and low in calories). And it’s so good for you! Buy it in a piece, wrap it in waxed or baking (parchment) paper then tin foil and store it in the door or the coolest part of the refrigerator. Replace the waxed paper regularly and wipe the rind if it shows sign of moisture. It will store well for a month or two, but will eventually become dry and stronger to taste. Grate parmesan as required, because it quickly loses its aroma and flavour. Parmesan can be frozen treble-wrapped in tin foil for up to 6 months, but it will be crumblier and slightly drier when thawed and should be used within a few weeks. Grana is the generic name for a group of cheeses which includes parmigiano-reggiano and grana padano. Parmesan is made in a restricted area in Emilia-Romagna (Parma, Reggio Emilia, Bologna and Modena) and its artisan production is strictly controlled. The cheese is matured for at least 18 months. Grana padano is made in a wider area in five regions in northern Italy and although it has similar properties to parmesan, its quality can be variable. It’s not aged as long as parmesan, but it’s easy to grate, melts well, isn’t greasy and browns well just like parmesan, and it’s considerably cheaper. I’m not sure that this still applies, but parmesan used to be made only 6 months of the year while grana padano was made year-round. Our favourite way with zucchini flowers is stuffed and fried (anything fried at our place is a no-brainer!). Goat’s cheese seasoned with lemon and herbs or with anchovies, a spicy almondy chilli paste, and a fresh pea puree lightened with mascarpone are three ways we like, but the possibilities are endless. Just keep the filling light and don't over-fill the flowers.